Amy Hudson Weaver calls El Pardito Island “a magical place,” where the rhythms of life are dictated by family, friends and – most of all - fishing. Located in the middle of the Gulf of California, El Pardito is home to just a few dozen villagers, all of whom make their living from the sea. But what El Pardito lacks in people it makes up for in marine diversity – nearly 300 species of fish live in the surrounding waters. 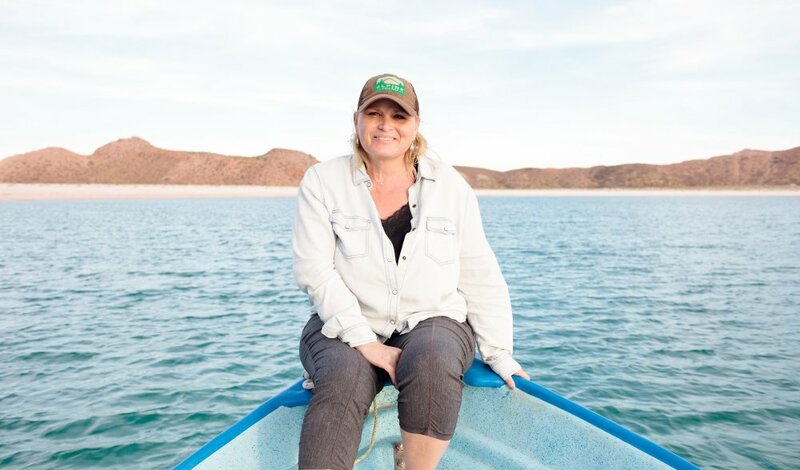 Amy Hudson Weaver is working hand in hand with local fishermen to protect fisheries and fishing families in Baja California Sur. As coordinator of the sustainable fisheries program for Niparajá, a Mexican nonprofit conservation organization, Amy is helping create a network of small fishing refuges that will rebuild fish stocks and ensure healthy ecosystems and healthy communities for the long term. As coordinator of the sustainable fisheries program for Niparajá , a Mexican nonprofit conservation organization, Hudson and her team work with the fishermen in El Pardito and other Gulf communities to protect fish stocks – and a way of life that has sustained generations of families. Both are jeopardized by overfishing. In 2012, together with the communities, and the Mexican government, Hudson and her team worked to create the first fishing refuges in the region – small networks of no-take zones in areas where fish populations have fallen. Fishermen help design the refuges and participate in enforcement and monitoring. Now, Hudson and Niparajá are focused on building on the fisheries management successes achieved in the Loreto to La Paz coastal corridor – and expanding them throughout Mexico. This includes developing and implementing national-level policies and regulations to enable sustainable fisheries throughout the country. We talked with Hudson about the work she does with small-scale fishermen to improve fishing practices and with governments in Mexico to better manage the resource. What makes the Gulf of California, and El Pardito in particular, special to you? Hudson: I had the fortune to come down to the Gulf of California as a student, and work on lots of projects. I eventually found work down here and end up staying. I've been living and working in the Gulf of California for over 20 years. And I have been coming to El Pardito for more than 25 years. It's a small island full of a family of fishermen that have been living here for about five generations. Life is really connected here to all of the surroundings. You can see whales go by. You can wake up and you see dolphins. I feel fortunate to get to work here every day, and to get to work in all of the communities and in the environment that I do. What are the challenge facing fisheries in the Gulf of California? Hudson: Like in many places in the world, small-scale fisheries here are really important. They provide food for families, but they’re not very well managed. There's not a lot of information about how many people are fishing, how much are they fishing, what times a year they're fishing and what gears they're using. So there's not a lot of control as to how fishing happens. In this area, the fishermen had begun to get concerned about the trends they were seeing. Some of the fish were harder to catch. Some were less abundant. Some of the fish were smaller in size. What fishermen were really worried about is: If it's that way now, and the fishing fleet is still growing, what's going to happen in the future? What can we do to stop from catching all the fish now and make sure there's fish to reproduce for the future. How do the fishing refuges work? Hudson: Here in Mexico it's called fishing ‘refugios’ or ‘refugios pesqueros.’ The fishermen designed sites to stop fishing for five years, and to monitor the sites and see how they're doing, and if they're recovering. And in the five years, they decide whether they want to continue to protect those sites, if they want to open them to fishing, or if they want to change the sites, make them bigger or smaller. Have fish stocks begun to recover? Hudson: We’ve had some positive results in the first five years. Inside the refugia, there's been about 30% more biomass, so there's more fish inside the no-take zones. But also more than 65% of the fishermen said that they noticed more fish in their catch (outside the refuges). When we asked all the fishermen if they were interested in continuing with the zonas de refugio, an overwhelming number of them were on board. When we went through the process to request for the renewal, 90% of the fishermen signed on. What are the biggest changes you’ve seen in fishing communities like El Pardito? Hudson: This is like my second home. The folks on El Pardito, I've watched them grow up. They used to fish all with rows and sails, and little canoes, dugout canoes. And now, they fish with outboard motors and open skiffs, and they go further offshore than they used to. When I started coming here, a lot of the fishermen started talking about how fishing has gotten harder. It's harder to catch the same amount of fish, the same kind of fish, the same quality of fish. It costs more now to fish - gasoline prices goes up, ice to refrigerate the catch goes up. It gets more expensive every day. There's more fishermen catching more fish, but there's not necessarily more fish out there. How is your organization working to expand good fisheries management practices? And how important is it to develop and implement national-level policies, regulations and management practices to enable sustainable fisheries throughout Mexico? It’s critical to have strong legal and regulatory instruments to manage fisheries – clearly established rules for all fishermen to follow. We’re working on a couple of things that are really important. We are trying to increase the use and availability of territorial concessions for fisheries – these are defined geographical areas where fishermen have exclusive rights to harvest over a determined amount of time. This would create more defined access rights and establish the idea of being good custodians of the resource. Also, the fishing refuges are a model that can be replicated and modeled for other communities. We’re working to expand legislation so it not only establishes how the refuges are created but evaluates how successful they are and how they are to be renewed. How does the health of a small-scale fishery in the Gulf of California connect to the larger challenges facing our oceans?